A Home for the Old is a role-play scenario designed by Fredrik Berg, a multiple award-winning Danish designer who has, over the past two decades, created a significant body of work in role-playing. His works often address delicate topics such as bullying, parenting norms, and discourses around obesity and anorexia. Using the role-play form he often makes the participants confront their own unease with the difficult topics. Ironically, his works could be well analysed with Viktor Shklovsky’s ideas of ostranenie (estrangement) — which was the theme of the academic track of Worldcon 75. After discussing the situation with the Finnish program facilitator, numerous members of the program committee of Worldcon, and people who made the call to pull the program, this is our best understanding of what happened. As our aim is not to cast blame, we will not name individuals aside from Berg, who considers himself publicly accountable for his creative works. The program description in the online program of Worldcon. A Home for the Old premiered at the Danish freeform role-playing convention Fastaval in 2013. The scenario was run at Tracon Hitpoint in Finland in March 2017. 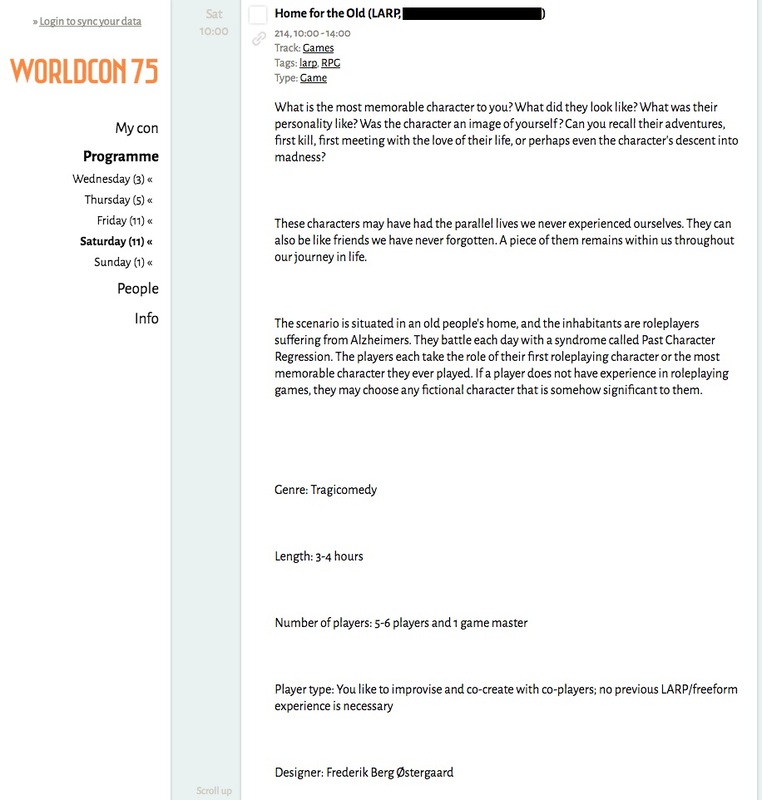 The Worldcon 75 program team curating the game track found the scenario interesting and requested a Finnish person to game master (facilitate) the run in Worldcon. The same blurb, although re-translated, that was used in Fastaval and Tracon Hitpoint, was used in the Wordcon programme. On the second day of the Worldcon, a few people started to object to the presence of the larp, based on the programme blurb. The social media team noticed these tweets and brought them to the attention of the Worldcon team responsible for safety and code of conduct (“Turva”) at the event. Some examples of tweets critical of A Home for the Old based on the program description. (c) since A Home for the Old does not feature written characters but gives agency to the player to bring in their own creations, there is a possibility that all of the players would not treat the subject in the appropriate gravity. The programme committee was not present when the decision was initially made, and there was no attempt to discuss the situation with the Finnish facilitator of the game. The facilitator was given forewarning on Friday before noon via email and soon after the decision was announced publicly on the official Worldcon Facebook page. The convention apologized that it had included the larp in the first place. The cancellation announcement stated that the convention acknowledges that the topic of A Home for the Old “is not suitable one”, got the name of the work wrong, and incorrectly claimed that the larp was submitted to Worldcon (while it actually was invited). The statement has been updated three times since, and different stakeholders were included in the dialogue to improve it. Initially, Worldcon 75 — a convention filled with interesting program on the plurality of sexuality and identity, disability, and access — considered roleplaying unsuitable for exploring Alzheimer’s. This was changed in the later iterations of the announcement. In the fourth iteration the work is finally named correctly. For example, in January 2017 the Finnish Museum of Games was opened in Tampere to preserve, exhibit, and study Finnish games. The core collection of the museum includes numerous tabletop role-playing games and two larps. Similarly, the public discourse see games as a medium where complex ideas can be explored. Most recently this was visible a fortnight ago, as the culture section of Helsingin Sanomat (the largest newspaper in the Nordic countries), devoted a full page to a story on Miska Fredman’s multi-layered role-playing game Sotakarjut (“Warhogs”), and how the death of his child influenced that game. In this context the decision made by Worldcon 75 to pull A Home for the Old from its program appears outrageous. Obviously this is not the first time Nordic role-play runs into these kinds of attitudes. The idea that games are always light and fun is a strong one. The idea that games are ultimately trivial, and thus if they attempt to address sensitive topics they automatically trivialize them, does surface from time to time. An example of this is the public discussion on the culture pages of Swedish Aftonbladet tabloid in 2011 when Just a Little Lovin’, a larp about the HIV epidemic devastating the New York gay scene in the early 1980s, was announced. Based on the webpages of the larp which was yet to be played, a cultural journalist interpreted it as exoticism of basking in glory of aestheticized tragedy. (Tova Gerge has written an account.) The latter runs of Just a Little Lovin’ have paid very close attention to their websites, and the Nordic role-play community should have learned this lesson by now. Our take-away for the Nordic role-players is that we need to learn to write for outsider audiences. At Fastaval it is obvious that play is a powerful tool for exploring difficult topics. At Worldcon a more serious framing is needed. Our take-away for Worldcon is that we hope that Worldcon will be better at recognizing games as a deeply meaningful expressive medium. Worldcon 75 issued a statement on the cancellation of A Home for the Old. I was consulted and had some impact on the statement. This new statement is a lot better, indeed ! As an American, I think y’all should have just turned around and banned the Americans who probably caused this. Well that’s not really the right response either. That just creates needless adversity. What should’ve been done is issue a statement that defends Games as meaningful art about difficult matters and explains the whole thing as a misunderstanding. In a way that doesn’t attack the outraged folk, but gives them a way out. And if the outrage would’ve continued, then just let it burn while also taking a stand to defend what’s right. But no banning (unless it becomes disruptive), instead have inclusivity. It doesn’t need to be us vs. them. That immediate assumption is what started the whole thing! Small difference in the periodic WorldCon witch hunts. Just look at the last non-Puppy Twitter witch hunt in London. As tempting as that might be, I agree it’d great additional problems. Cultural shock is a real thing, and seeing how most Americans are only now starting to realise that the “World” part of WorldCon means more than than just the space between the East and West coast of the States, it’s expected that a clash would happen. But it’s also telling of their ignorance and unwillingness to adapt to a culture that’s different from theirs (god knows we have to do the same thing when we travel to their country). At least it’s getting spotlighted. We are indeed living in a dystopia, but it’s not quite like I imagined to be.